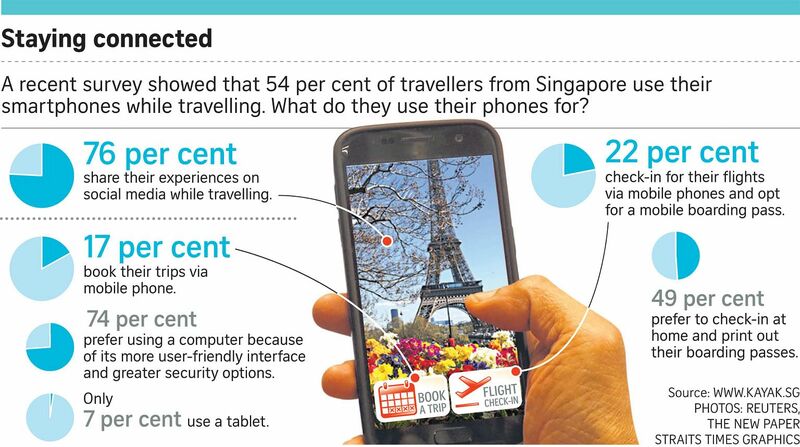 More than 54 per cent of travellers from Singapore use their smartphones while on holiday, with the number jumping to 70 per cent for those aged between 18 and 24. This is according to travel search engine Kayak, which polled 1,000 people from Singapore as part of a worldwide survey of more than 12,000 people last month. One key reason for using their smartphones is to share their experiences on social media, with 76 per cent of those surveyed doing so. This is in contrast to a decade ago, when only 14 per cent of travellers here shared their experiences online. "Consumers rely on their smart devices in every area of their lives and travelling is no different," said Kayak South-east Asia director Imbert Fung. The survey also found that 61 per cent of those polled consulted online travel agencies to plan holidays. In choosing their next holiday destination, 44 per cent of those surveyed used social media, while 33 per cent turned to travel blogs. While only 26 per cent of respondents used a traditional travel agency to plan their vacations, Mr Fung said they still serve as an additional source of information for travellers. When it comes to tasks such as booking their trips online, res- pondents were still more com- fortable using computers rather than smartphones. Citing greater security and a more user-friendly interface as reasons, 74 per cent of the respondents prefer to make their travel bookings on a computer, compared with 17 per cent who do so via their smartphones. Only 22 per cent of those surveyed check in for their flights by using their smartphones or opting for a mobile boarding pass. Civil servant Dhirah Othman, who vacationed in Japan last December with her husband, bought a SIM card with a data plan in Japan for her trip, saying it was cheaper than using data roaming on her existing phone plan. She found her smartphone invaluable during her trip, using it to not only stay in touch with her family and friends, but also for finding her way around. "I use Google Maps a lot when I travel," said 33-year-old Ms Dhirah, adding that she also used mobile apps that helped her to get around the Japanese transportation system and find halal food.